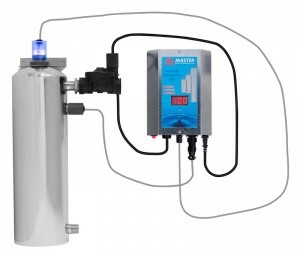 We purchase most of our equipment from Master Water Conditioning Inc. in Pottstown, PA. They have expanded up and down the east coast and are a leader in the industry. They not only use the best products on the market but also design and modify their own components to make them better and more efficient. They stand behind all of their products with long warranties with no questions asked. We can correct just about any water quality problem you may be experiencing with these top of the line conditioners. These units are highly effective at removing sediment from your water by creating a whirlpool effect. The sediment is forced to the center and drops out of the water into a tube. It is purged every couple of months by simply opening the purge valve. There are no filters to replace and no screens to clean. iron does not affect them. 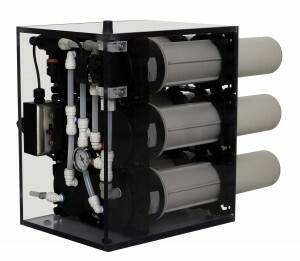 They are the most maintenance free sediment removal units on the market today. They are great for high iron situations and as pre-treatment for conditioners. These time tested filters remove sediment from your water by filtration. They are inexpensive to install and work very well. We install them with a bypass on the piping for future service. If your water is low in mineral content, they are a great cost effective choice. This screen is specially designed to greatly reduce the risk of plugging up as it prevents sediment from being drawn into the pump and ultimately into your plumbing. It is placed over your pump in your well. This device seals off very low quality water where it enters your well. It is used where possible in extreme sediment producing wells. Our down hole camera is needed to determine its positioning. These durable units correct pH and/or clean up dirty colored water. They are extremely reliable and require very little maintenance. They will save you thousands of dollars in future plumbing repairs. This softener series removes hardness, manganese and iron. They are equipped with the new advanced Logics timer by GE (a name we have all come to trust). We can adjust each cleaning cycle according to your particular needs. It tracks water usage history and is equipped with a meter to calculate the exact day your unit should regenerate. This feature saves you 30%-50% water and salt usage during the regeneration cycle. These softeners also use turbulator technology to thoroughly clean the resin for extra long life. Some of our softeners have been in service for over 25 years! You’ve gotta check out the benefits of soft water. Then you’ll need to experience it yourself! These units are the next generation softeners. They do not need to regenerate with solar salt and do not add sodium to your diet! They work by crystalizing the hardness so that it does not stick to plumbing, hot water heater elements, clothing, skin and hair. They have been tested by one of our suppliers with great results, but there is yet to be a guarantee on the resin’s longevity. These units remove rotten egg odors by using a special mineral that oxidizes and filters hydrogen sulfide without injecting chemicals or oxygen into your water. It is very effective. Removes hydrogen sulfide and iron by using compressed air to oxidize the minerals. It is followed by a Multi Media Automatic Backwashing Filter to remove the oxidized minerals, making your water crystal clear. We have experienced a 100% success rate removing hydrogen sulfide with these units! These combination neutralizer / softeners are our most popular units because they effectively do so much. They effectively neutralize, soften, and remove iron and manganese from your water. They are compact, saving you space and come equipped with the logics metered system that saves you up to 50% on salt and water usage during the regeneration cycle. If you have publicly chlorinated water, one of these activated carbon units is a great choice. They not only remove the chlorine to give you great tasting water from every spigot in your house, they also remove the dangerous cancer causing DBP’S. DBP’S are disinfectant byproducts that are produced by disinfecting with chlorine. Activated carbon filtration removes them. These units automatically clean themselves to give you nearly maintenance free operation for many years. These units produce all the benefits of activated carbon described above while at the same time, softening your water, saving you energy costs and plumbing repairs. They also comes equipped with the next generation metered timer that enables us to alter the regeration cycle to fit your specific needs, check history for troubles shooting and it saves up to 50% on salt and water usage during the regeneration cycle. If you have nitrates in your water and wish to drink water from any spigot in your house, then this unit is your best choice over the reverse osmosis. It is guaranteed to keep the nitrate level below the EPA limit. It is also equipped with a softener because nitrate resins will foul with hardness after a few years if the hardness is 4gpg. Plus you get all the benefits of soft water. Reverse Osmosis technology produces better than bottled water quality at a fraction of the cost. It removes a host of heavy metals and chemicals including lead, mercury, and arsenic to name a few. They also remove nitrates. If you are looking for safe drinking water without the cost and hassle of bottled water, Reverse Osmosis units and coolers are your best choices. Kelly A. Reynolds, MS PH, PhD., featured in the April 2008 issue of Water Conditioning and Purification International Magazine. This system is used to correct very low pH or high CO2 water. The green staining caused by this situation is a sure indication that your plumbing pipes are is being eaten away by the low pH water. The Stenner pot ash system injects potassium bicarbonate into your water supply to neutralize it. A standard system is fairly inexpensive. It comes with a Stenner variable speed feed pump, a mixing valve, and 30 gallon solution tank. Sometimes a water meter and switch are needed. We will make the recommendation when necessary. This system requires some maintenance but is extremely effective with very low pH water. Hydrogen peroxide is a very effective oxidizer. It easily oxidizes hydrogen sulfide from your water as it is injected into your water supply using the Stenner feed pump. A multi media filter is installed after the injection point to filter out the oxidized gases and minerals. It has a 100% success rate! Carbon removes hydrogen sulfide, but is not always effective. Sometimes a peroxide system needs to be installed in-line before the centaur unit to oxygenate the carbon. The centaur carbon filter then acts as a multi media filter. Chlorine is very effective in oxidizing hydrogen sulfide and iron, and it kills bacteria. But, it is rarely used because it creates maintenance issues. As water quality changes, the amount of chlorine injected may need to be adjusted also. A large retention tank and an activated carbon filter would need to be installed increasing the cost. This unit utilizes a special resin to remove sulfates from the water. As a result, the odor goes away. This is installed if changing the hot water heater anode rod to an aluminum based rod and chlorinating the hot water heater does not remove the odor. It uses solar salt to regenerate. These highly advanced units destroy bacteria to give you microbiologically safe water. They are used when shock chlorination does not kill the source of bacteria or if a customer wants to be sure that bacteria will not be an issue in the future. They come equipped with an alarm and a solenoid valve that shuts the water down should the bulb burn out and during power outages. This feature is absolutely necessary to prevent post uv bacteria contamination. Without it you will need to chlorinate your pipes after every power outage.